We were given the task to create a web site for Myriad Contracts who install playground equipment in the three counties area. We were given their logo as a start point and had to create something that complimented that in terms of colours and style. A simple layout using images and a flash gallery were installed showing all their work and installations. The web site has been very successful and has been working extremely well for Myriad. We also support their IT and are at hand if there are any problems with their computer systems. 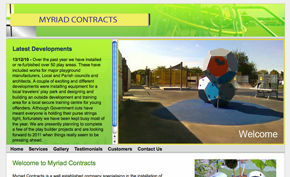 Why not view the Myriad Contracts web site.